Akubra Hats have been Australia's quality hats since the early 1900's, ever since Arthur P. Stewart set up to make a hat to meet the needs of this bustling new colony. Australians in the earlier days, much like the Americans of the West, needed better hats than the usual, and, like the Americans, they had to make them for themselves. Akubra hats stood the test of life on the cattle stations and droving routes. Akubra hats still stand the test, not only in Australia, but throughout the world. Good wearing, and God Bless, Cultured Cowboy. Choosing Akubra combines good taste and good sense. Akubras are among the finest hats being manufactured in the world today. (Especially considering the affordable pricing for such quality.) For over 100 years, Akubra has taken the highest quality, super fine range-rabbit fur, luxurious silk linings, full grain leather sweatbands and handsome trims to create hats that have become part of Australia's heritage. Akubras offer uncompromising durability that provides superior protection from the sun, wind, rain and snow. It's then said that an Akubra improves with age, often developing special characteristics worn into it by its owner, be it a rugged range rider or a "city slicker". Akubra is a great hatmaker for hard to find extra large sizing. Australians needed hard wearing hats with wider brims than the usual European brims, to protect them from the sun and rain. Akubra soon became known for the durability and comfort of their felt hats, and recognized throughout the world for the Australian styling with a flair that reflects the independent, confident, and sometimes adventurous spirit of the dinkum Australian. Akubra is the only major hat company making fur felt hats from start to finish, beginning with the raw skins through all the processes of preparing the fur, forming the hood, dyeing, blocking and pouncing the hat to the final trimming. Their control of the entire process allows them to produce an exceptional quality of fur felt. The quality of Akubra's felt is attested to by the fact that they have no need for the colored powders used by many manufacturers to even out the color and hide flaws in the felt. The reputation of Akubra hats is built on the long lasting quality of their fur felt and the comfort of their reeded leather sweat bands. Akubra is an owner-operated company with an up-to-date plant, and a long term dedication to quality. Some of the distinctive features of Akubra hats are described below. The prime factors in the quality of fur felt are the quality of the fur used and how tightly it is worked together in the felting process. The basic fur in a felt hat is the under-fur of rabbits, and the quality of this fur is a prime factor in the quality of the hat produced. Fur from wild rabbits gives the best quality. Akubra not only uses more wild rabbit fur in their hats than any other hat company, but also a better fur, as they cut their own fur from the skins, keeping control of quality of the hats from start to finish. The quality of the felt in American hats is often designated by a number of X’s, an arbitrary value differing between manufacturers. Akubra does not use X’s. They produce four felt qualities. Their standard quality, with a world-wide reputation for durability, is offered in two finishes, the Imperial Quality, used in most of the standard hats we offer, and the Superfine, used in the Slouch hat. The Sydney is made from a lighter weight felt, using a finer fur, with a finish similar to the Imperial Quality. 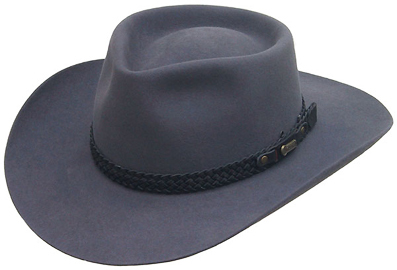 Their premium quality, developed recently for the Heritage Collection, is very much in the Akubra tradition, a stronger, more dense felt for even greater durability, which also allows a finer pouncing for a superb finish. Pliofelt is the new pliable fur felt used in Akubra’s crushable Lifestyle Collection . The leather sweatband inside the hat is the only part which touches the head and hence is the key to a comfortable hat. Good leathers are breathable, soft and absorbent. In the best hats the leathers are "reeded" in order to conform better to the head. A reed, once a thin piece of rattan, but now commonly a plastic fibre, is encased in an impervious ribbon of oiled silk or synthetic material, and attached to the bottom of the leather. The ribbon helps to keep perspiration from staining the body of the hat. The reeded leather sweatbands used by Akubra are made of the finest roan sheepskin, specially tanned to ensure comfort. These hats are genuine Akubras, made in Australia and built for durability. Australians spend a lot of time outdoors. To protect themselves from the harsh sunlight they wear hats as a matter of course, and they expect their hats to last. Australians give hats rough treatment - fan the fire, water the dog, or gather the chooks' eggs, an Akubra is expected to handle it all, day in day out, year in year out. You can wear your Akubra with confidence, knowing it's quality and style are top-notch. Most hats can be shaped either by bending and manipulating wire built into the outer edge of the brim, or by steaming the hat and changing curves up or down a little. (Sometimes even radically!) Akubra hats are made from the highest quality wild rabbit furs. Fur hats use the best felting of the animals. This felting, under a microscope, would look like a thick blackberry bramble patch. Steam loosens the tiny barbs so the felt hat can be shaped, and so that once the hat is removed from the steam, the hat keeps the new shape. The felt rejoins against itself and maintains the new shape. Pretty neat, huh! If you need to buy a steamer, we can get them for you. If a little less investment will work, get a nice stream kettle. Anyway, I like to shape a hat brim so that the angle of the brim matches the angle of the jawline of the wearer. This almost always makes a hat look good on people who even think they look bad in a hat. They don't look bad; they just have not gotten the right shape. With almost all felts you can make these little adjustments so that your hat complements your face. If you're caught in a downpour, wear your hat. It is here to keep your head dry! When you get out of the rain, carefully take your fingers and shape the hat where you want it and let it dry at room temperature. You might check on it a time or two. It will dry and hold the shape again. A soaking rain will work like steam. Think of it as, if the hat is soaked and the brim edge falls, your hat thinks you are reshaping it. Just put it back as it dries, and you're as good as new! The higher the quality of your hat, the more you can endure the elements. It is not unusual to pass this Akubra quality to your grandkids. Remember that good fur felts will breath, and be much more comfortable in the sun, than cheaper felts. Most hat wearers are wearing to protect from sun damage, (or to look good)! Need a lower priced hat? Be sure and study Tassy Crusher Australian Hats. Crushable Tassy and Outback Adventure hats. How do you help weather proof your Australian hat? These fur felt Australian hats can be assisted by using several coats of Scout Brand Rain & Stain Protector. Spray, let dry about 10 minutes. Spray again. Let dry about 10 minutes. Repeat a couple more times and make your headwear more weather resistant in snow and easier to clean in mud. Remember the key is several lighter coats. Retreat after washing. CAUTION: Only treaty the TOP side of your hat. Do not treat the bottom or inside, or you will not be able to steam and re-shape your hat if you waterproof all sides. Please be sure to specify your size when ordering!